After weeks of testing, I learned that the Olympus 60mm Macro f/2.8 Lens is a surprisingly versatile lens. 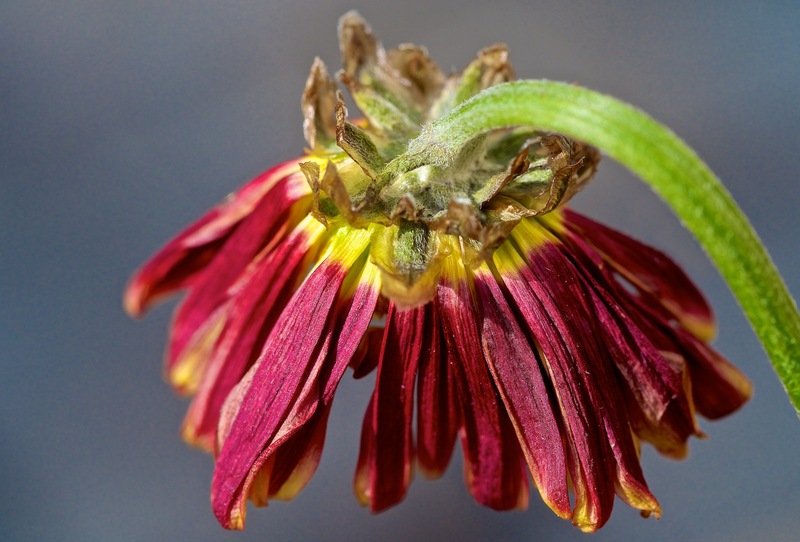 Yes, it is excellent for 1:1 macro photography. But I've also been reaching for it to shoot sporting events and portrait assignments. And in all of these conditions, the 60mm performed exceedingly well. For a closer look at any of these images, click on them for an enlarged view. This will allow you to examine the details of the photos more closely. All pictures by Derrick Story. On the side of the lens barrel is a four-position switch that allows you to set the focusing range for the type of work you're doing. The lens will focus closely regardless of where you have the switch set, but it will do so faster if you have it set for the range you plan on working. For super close 1:1 photography, move the switch to the 1:1 position. It won't stay there; it's a spring switch that prepares the lens for this distance. After you focus, you can see the actual magnification you're using via the scale on the top of the lens barrel. It's easy to use and only took me a few minutes to get the hang of it. 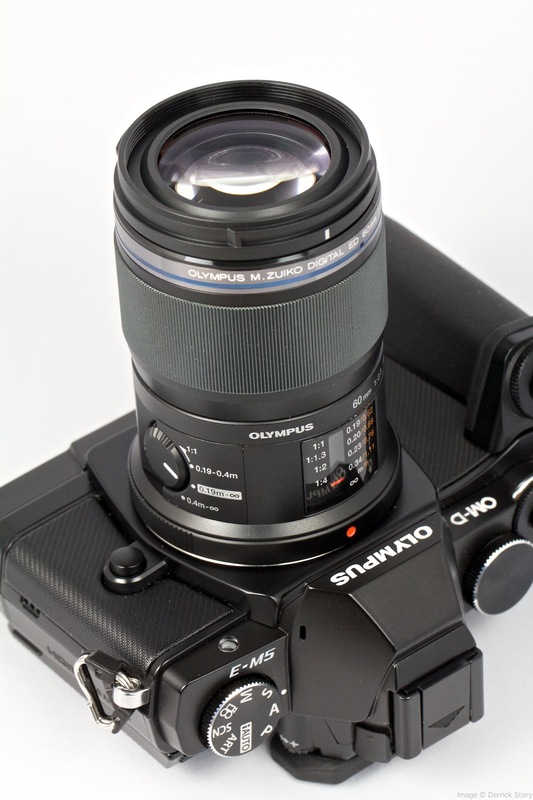 Because the Olympus OM-D E-M5 has excellent 5-axis image stabilization built in to the body. 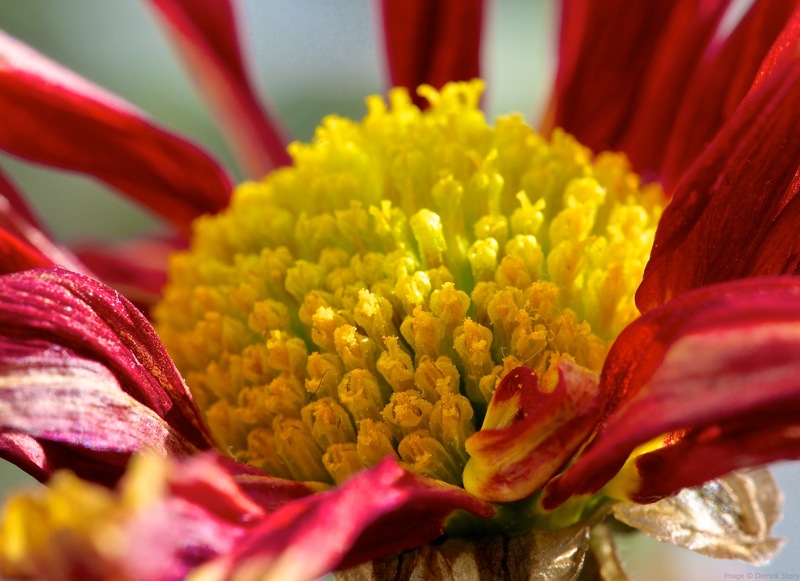 I was able to hand-hold these flower shots, even at high magnification. The 60mm does not have built-in image stabilization. It relies on the IS in every Olympus micro four thirds body. As much as I like close-up photography, I love shooting portraits. And the Olympus 60mm is my new favorite lens for this work. 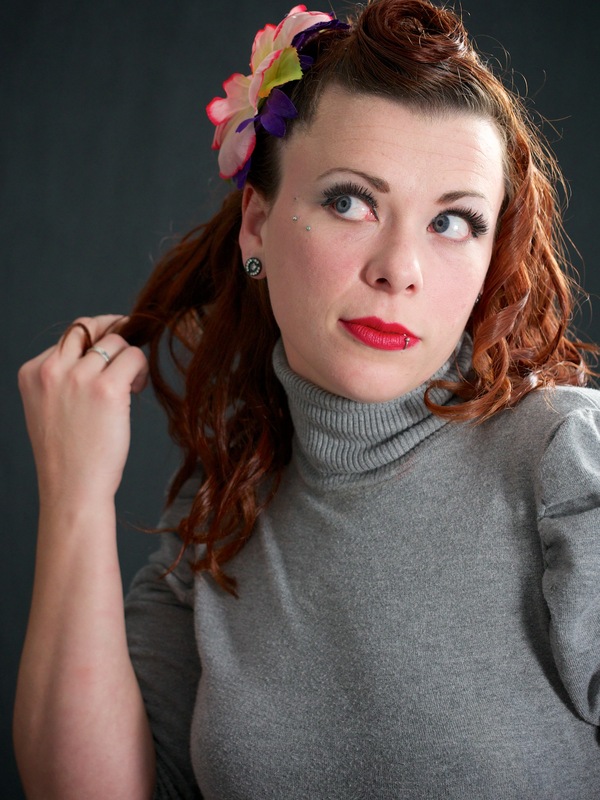 For this shot of Lovely LadyJ, I used the 60mm in the studio, shooting wide open at f/2.8. The images were extremely sharp. I didn't retouch this shot so you could see how the the model is rendered with the lens wide open. You can always soften an image in post, but you can't add detail that wasn't originally recorded. This lens gives you everything you need at capture. You take it from there. As a side note, we shot a series in the rain too. Lovely LadyJ asked me if I was worried about using the camera under those conditions (as she looked at it covered in rain drops). Both the 60mm and the OM-D body are weather sealed. The rain did not bother either at all. 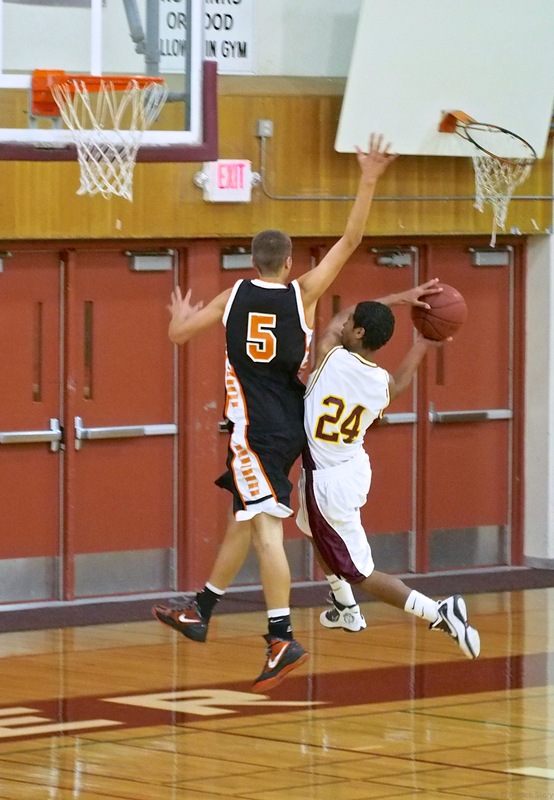 Covering basketball was a good test for the autofocusing capability of the 60mm lens. For this series of shots, I set the focusing limiter switch to 0.4m - Infinity. I was pleasantly surprised by the focusing speed and accuracy of the lens on the OM-D body. So much so, that I began reaching for it repeatedly for indoor sports assignments. On the down side, maximum aperture is f/2.8 (compared to f/1.8 for my 45mm Olympus prime). But the extra reach was noticeable in the viewfinder. So I increased the ISO from my normal 1600 to 3200 when shooting with this lens. This shot was captured at f/2.8, 1/200th, in JPEG mode, in a fairly dark gym. I rarely shot with this lens at the "default" 0.19m - Infinity setting that is highlighted in silver on the side of the barrel. I was either working close at 0.19m - 0.4m, or shooting portraits and sports at the 0.4m - Infinity setting. By working this way, I enjoyed fast autofocusing throughout the shoot. If you want to focus manually, the wide, well-dampened focusing ring is a joy to operate. In fact, it works so well in combination with the electronic viewfinder on the OM-D, that it's actually pleasurable to turn off the autofocus and work manually. I love lenses that give me this option. At $499, the Olympus 60mm f/2.8 lens is a good value. Its quiet, precise operation makes it highly suitable for a variety of assignments, including macro, sports, portraits, and movie making. It is now an absolute "must have" lens for my OM-D kit. Congratulations to Dean Ray who won the Lowepro Pro Messenger 160 AW bag and wrote: "My day to day my bag needs change. So in turn, I need lots of bags. I need a bag for a full day of shooting in the parks and at the resorts. I also need a bag that looks good while at a wedding. Disney weddings can be so formal, and I need a bag to fit in that world as well as my needs as a photographer. Help a shooter out, Lowepro..."
Well, luck of the draw smiled upon you, Dean. Please send your shipping information with phone number (for shipper only) to derrick [at] thedigitalstory [dotcom] and I will get that Pro Messenger in your hands. As for those who didn't get lucky this week... stay tuned. I have even a bigger give away coming up. You won't want to miss out on this. 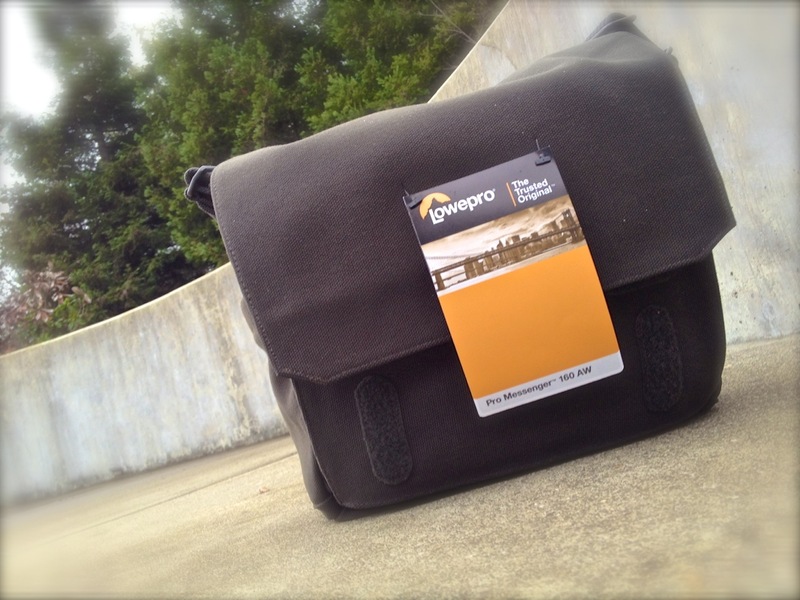 Here's your chance to win a Lowepro Lowepro Pro Messenger Bag 160 AW. This soft-sided bag has the feel of traditional canvas, but it's really a high-tech fabric that is more weather resistant and durable. Its handsome styling makes it the perfect urban bag for you DSLR or CSC kit. The Pro Messenger also includes a built-in All Weather cover for additional protection when the climate becomes hostile. Send me a tweet saying why you want this bag. Be sure to include the hashtags #ProMessenger and #Lowepro. Not on Twitter? No problem. 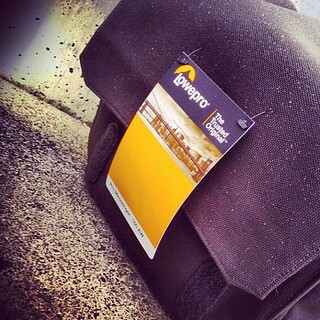 Share a photo of your current camera bag and why you need the Pro Messenger on Instagram. Add the hashtags #ProMessenger and #Lowepro. Not on Twitter or Instagram? Just add a comment to this blog about how you'd use the bag if you won. I'll randomly select a winner on Tuesday, Dec. 4. The winner will be posted here and on the TDS Facebook page. This contest is open internationally, but void where prohibited. One winner will be chosen randomly. Good luck! 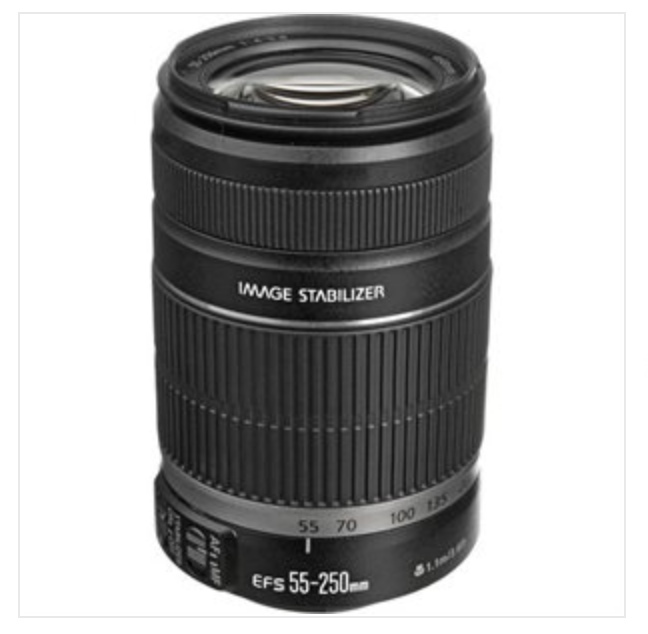 Buy.com is offering the Canon EF-S 55-250mm f/4-5.6 IS II Lens for $189.99 including filter and cleaning kit. This zoom features Canon's 4-stop compensation Image Stabilizer in a compact, lightweight package. Standard asking price is $299, so this is quite a deal. Other features include f/4-5.6 maximum aperture, 7 diaphragm blades, one UD (Ultra-low Dispersion) lens element, and optimized Super Spectra lens coatings. Terrific customer reviews too. It's a good choice for outdoor sports action and nature photography. Having the family gather once a year for portrait is a wonderful way to record "that moment in time." 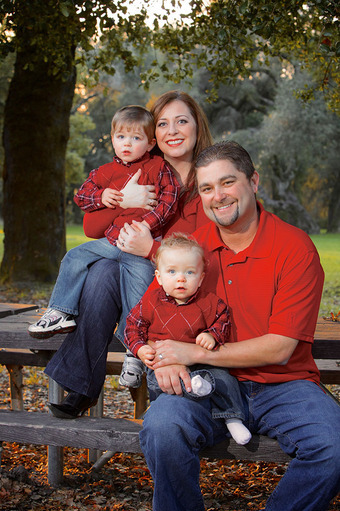 When done annually, you create a historical record that documents the evolution of the family as well as a photograph that is pleasing to the eye. These images can also be used for holiday greeting cards and to hang in the wall in the gallery at home. When children are involved, you usually have to work quickly. For this assignment, I used a Canon 5D Mark II, 70-200mm f/2.8 zoom, and a single flash fired by the CowboyStudio Wireless Hot Shoe Flash Trigger that was hand held by one of the family members there to help. We photographed for less than half an hour. And each "session" was just a few minutes long. Then we had to give the kids a break before regrouping. Keeping it simple is the only hope for success. My approach is to find a great location, have an extra set of hands available, use a single fill light, and work quickly. The results? They can be quite beautiful, as well as a historical family record. Lots of good information on how to integrate all of your images, from your iOS devices to digital cameras, using Apple technology such as Photo Stream, iPhoto, and Aperture. This week, I join David Sparks and Katie Floyd on the Mac Power Users show to discuss photography workflow. I cover iPhone photography, Photo Stream, iPhoto, Aperture, back up, and more during this 30 minute podcast. It's a good conversation with lots of tips. I think you'll enjoy it. The San Francisco International Auto Show features the latest cars from top manufacturers all over the world. 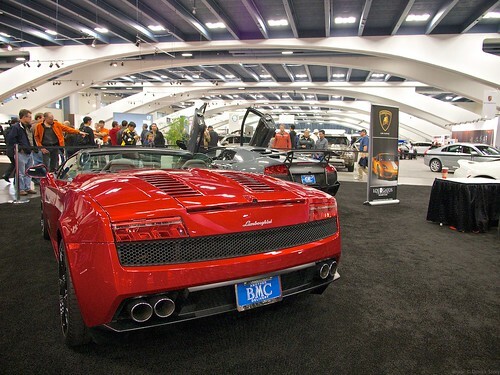 Visitors can see 2013 models of their favorite brands, concept cars of the future, and historical classics, all under the shining lights of Moscone Center in San Francisco. Lamborghini in Moscone Center at SF Auto Show. I packed my Olympus OM-D E-M5 (currently $949 US) and the Panasonic LUMIX G X VARIO 12-35mm/F2.8 zoom to photograph these great cars and enjoy the atmosphere. One of the features that I really like for these types of assignments is the "live exposure compensation view" through the electronic viewfinder of the OM-D. Black cars one moment and white the next presents a real exposure challenge for capturing detail. All I have to do is rotate the top exposure compensation dial while looking the the EVF to get just the look I want. But it wasn't all cars I had to work with. 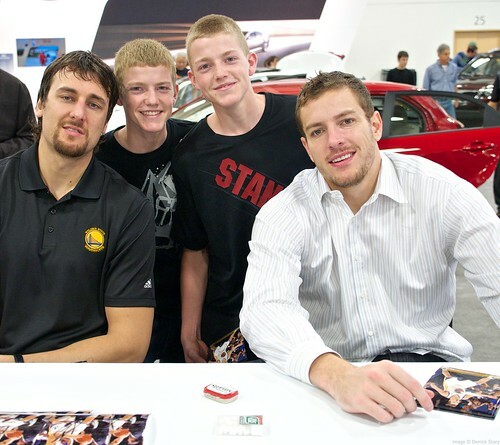 Golden State Warriors players Andrew Bogut and David Lee signing autographs. A guest appearance in the Kia booth by Golden State Warriors players Andrew Bogut and David Lee provided an opportunity to get both autographs and some fun portraits. Working in existing light only, the exposure compensation enabled me to capture a good rendering on their expressions. Twilight over Yerba Buena in San Francisco. 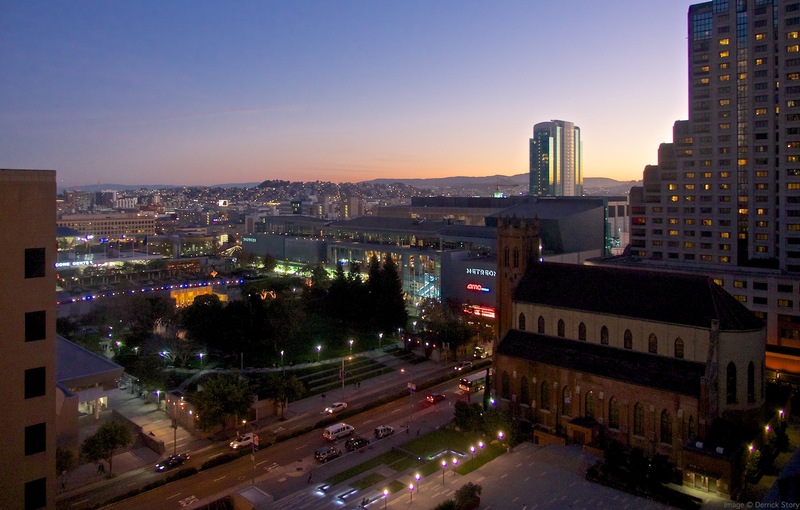 Finally, when the day was done, I was able to get a good view of the sun setting over Yerba Buena (the area where Moscone Center is located in San Francisco) and capture a twilight shot of the city. Just one camera and one zoom lens for an entire day of shooting. Note: the San Francisco International Auto Show is open until 8 PM tonight if you're in the City. Admission is $9 for a single, or two for one if you have a friend. Welcome to Black Friday: regardless of what day it is. Cyber Monday begins tomorrow, and will continue through the start of 2013. Retailers are ready for your hard-earned dollars. And it's not just the brick and mortars. We're receiving tons of promotional email. On average 5.9 offers a week from approved vendors. And it feels like more. 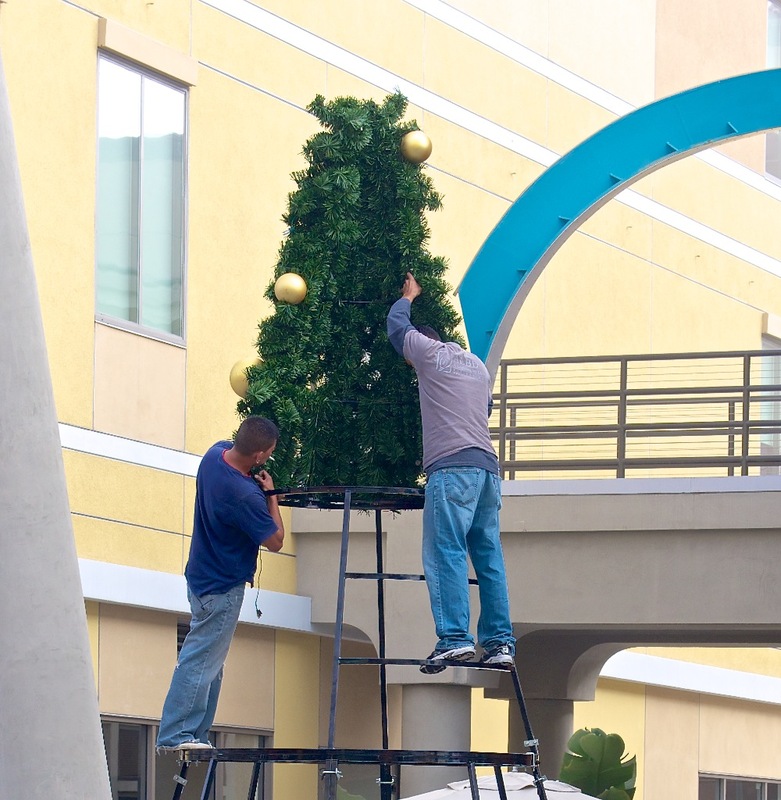 Assembling a Christmas Tree at an outdoor shopping center in Southern California. If you think this is the point where I'm going to rant about the commercialism of the holidays, I'm not. That ship sailed long ago. In a challenging economy, everyone is trying to make a living, and the holidays are a chance for retailers to finally "run in the black" before the year is over. That being said, I will be glad when it all settles down a bit. In the meantime, like everyone else, I'll sift through the shopping noise and try to find a few good deals for gifts. But the real holiday treat is the increased opportunity for cultural photography -- crazed candids, radiator wreaths, decorated malls, candy cane houses, and more. There are compelling shots everywhere. So don't be a Scrooge and miss out on the fun. Grab your camera, take some photos, and do what we do best: tell a story. My Instagram runith over.